Live — Angela Funovits, M.D. What happens on screen is so much more magical before your very eyes. Learn more about the live entertainment options for your event. Named one of the "Year's Best" by Corporate Entertainer Magazine, Angela is highly valued for her cultured and sophisticated approach to corporate entertainment. From promotion to production, Angela and her team go above and beyond to create a seamless and unforgettable theatrical event. 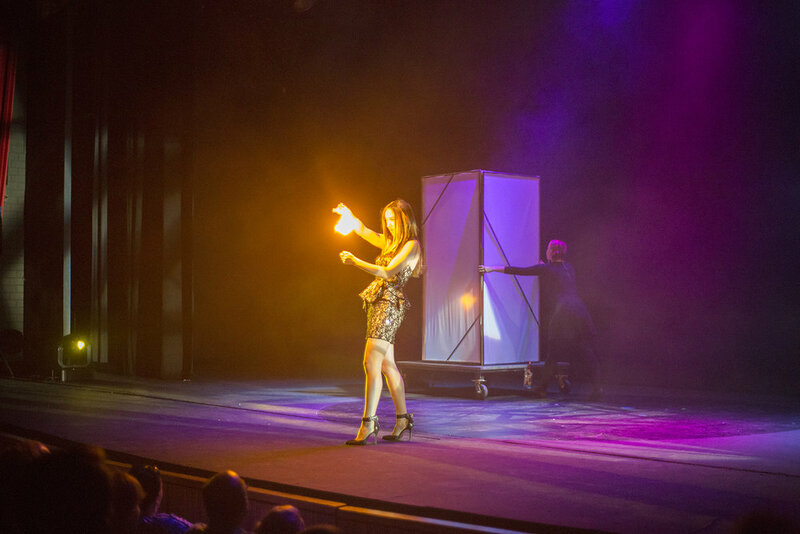 Creative imagery and feats of mentalism combine to make important events shine their brightest. It’s interesting to note that Angela Funovits is also a medical doctor. So it’s not so surprising to hear her tell the audience that as a mentalist, she regards her feats as a kind of scientific probing, dismissing the notion of “psychic” or cosmic powers at work. In any event, her stage-side manner, as it were, is amiable, fetching and magnetic as she sets up the parameters of her brain-confounding experiments with audience volunteers, often prefacing her instructions with, “This may sound strange, but…” Strange indeed, and call it what you will – mindreading, fortunetelling, old fashioned sorcery - the outcomes are invariably astonishing. So while I may have attended the show as a cynic, looking for chinks in the armor of staged illusion and so-called psychic phenomena, I left delightedly spellbound and otherwise duly mystified. Theatre of magic, to be sure. Lavish legerdemain, perfected prestidigitation, oh what a wondrous web we weave when first we practice… Where else can we go to have our trusted senses of reality so wildly manipulated and challenged… and genuinely enjoy it? There’s the magic. Feedback across the board from everyone was phenomenal! I made the decision early on to keep as much of the attendees "in the dark" about Angela's performance as much as possible. Of course, her act went well with our theme of "Amaze and Delight", but she also wove that motif into the narrative of her act. We all enjoyed the performance so much!